One of the things we love about the Trinity Arts Photo Club is the camaraderie and the willingness of everyone to share their knowledge. Being fairly new to the digital SLR world, we need and welcome all the help we can get. That being said, we want to thank Tracy Del Favero for organizing this field trip. 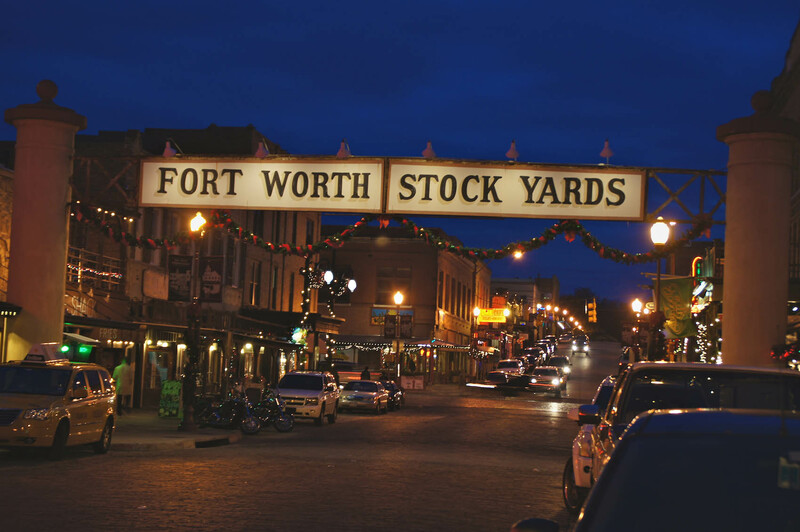 The group met at Cooper’s BBQ in the Stockyards for dinner early Sunday evening, December 11th. That was an experience all by itself. If you haven’t eaten at Cooper’s, you’ll have to give it a try sometime. To begin with, your plate is a sheet of paper similar to butcher paper. The rest I’ll let you experience for yourself. After dinner, more than a dozen of us headed to Exchange Street, set up our tripods, and took shots up and down the street; from Main Street to the Stockyards Station. 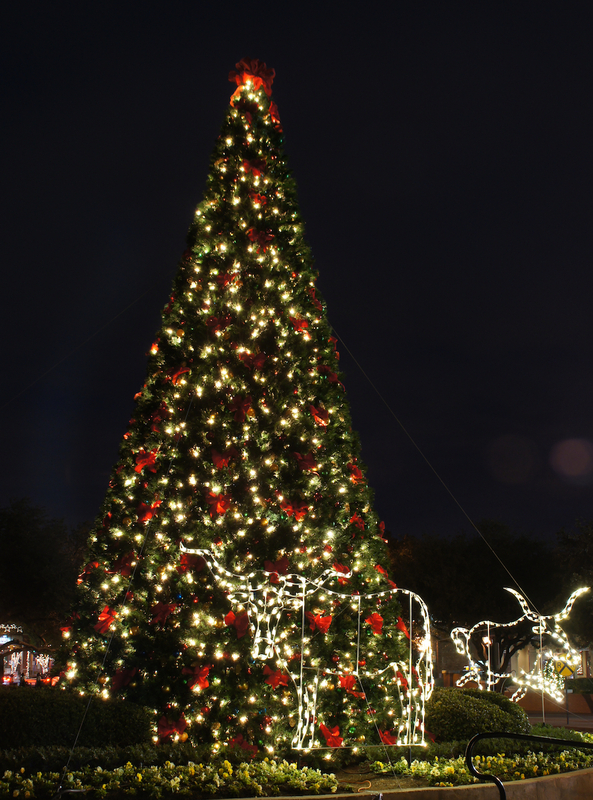 We captured the normal lights of the Stockyards, Christmas light displays, a Christmas tree with lighted longhorns beside it, a lighted horseshoe and wreath, and more. 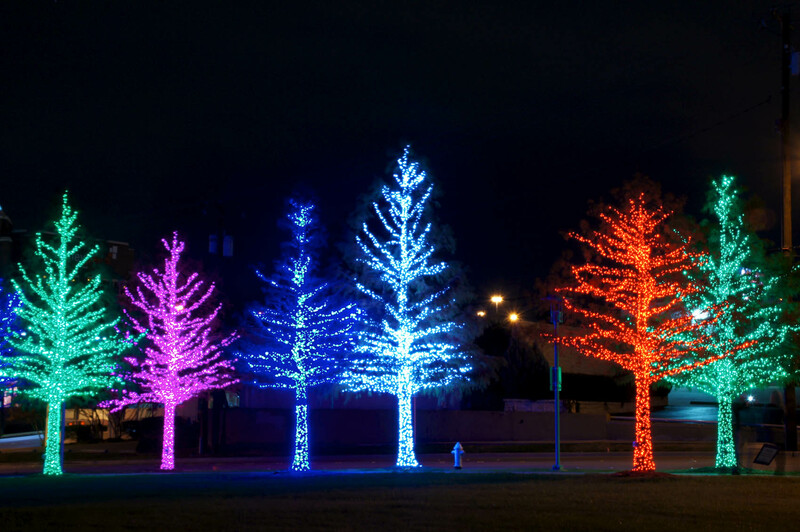 The weather was cool and the colorful lights put us in the Christmas spirit. Next, we drove to the Chesapeake Energy building in downtown where every tree on the lot is full of lights. It’s worth the trip to the Chesapeake Building just to see the light displays. 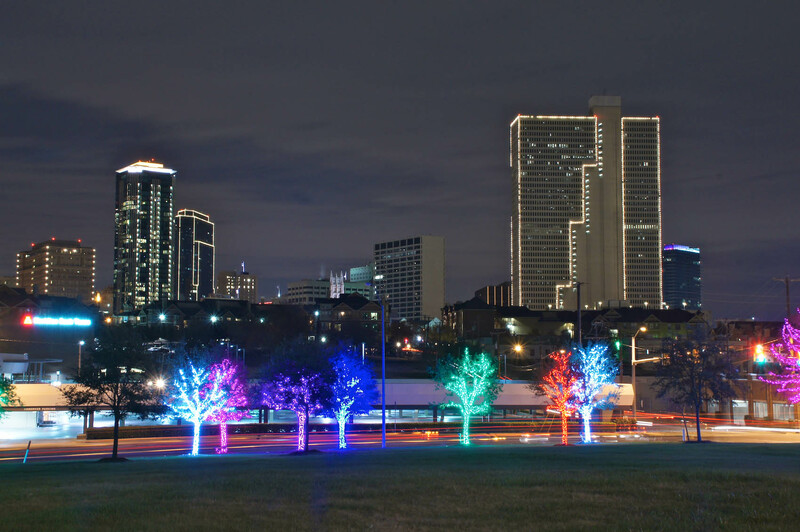 Some members took photos of the lighted trees while others captured the downtown skyline in back of the trees. It started to sprinkle a little and seemed to get a little cooler out so some members left for home while a few others ventured into town and Sundance Square for more photos. We really enjoyed ourselves on this outing and even gained a few photo tips along the way. We always find it interesting to see everyone’s photos and the different perspectives from which they were taken. Below are a few photos from this outing. 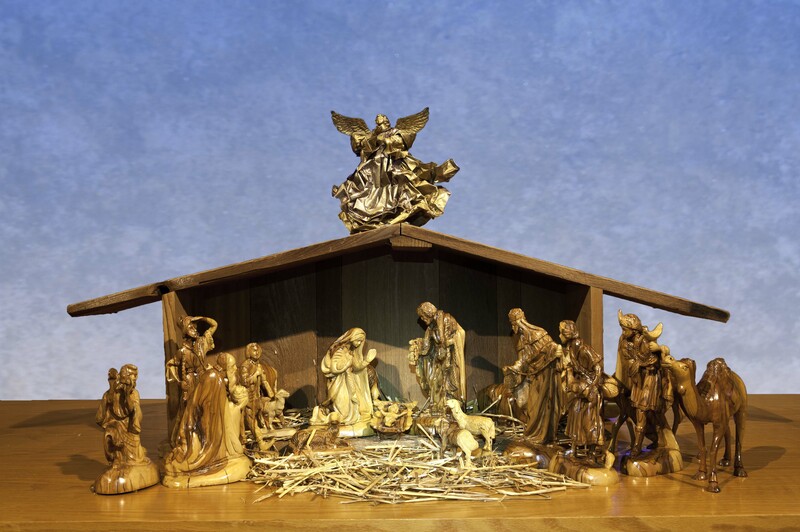 For several years now we have designed our own Christmas cards using nativity sets that I have photographed either on-site somewhere or in a table-top studio in my home. If I’m not using my table-top set-up, the setting usually leaves a bit to be desired. 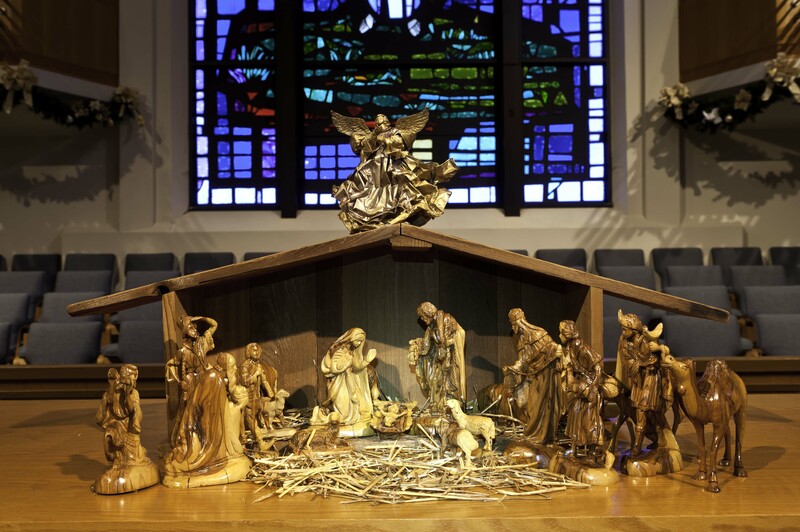 Such was the case this year as I used a nativity set in our church sanctuary. The choir loft and stained glass window were really distracting (see Figure 1) so I knew I had to do something. The steps that follow explain what I did in Photoshop CS-5. Looking at Figure 1 you can see it’s not a bad photo but it’s just not suitable as-is for a greeting card. I knew I had to get rid of the distracting background. So, I started by duplicating the background layer (Ctrl-J) and went to work on the new layer. With the crèche selected I added a Levels adjustment layer (Layer > New Adjustment Layer > Levels) and brightened the figures a bit. Now let’s get rid of the background. With the crèche still selected I inverted the selection (Select > Inverse), hit delete and voilà, I am left with only the nativity. See Figure 2. Well, the selection certainly got rid of the background but I need something behind the crèche or it will just look really blah. So I created another layer with a gradient fill (Layer > New Fill Layer > Gradient) and set the color to a blue that I thought would help with creating a pleasing shade reminiscent of the sky. See Figure 3. 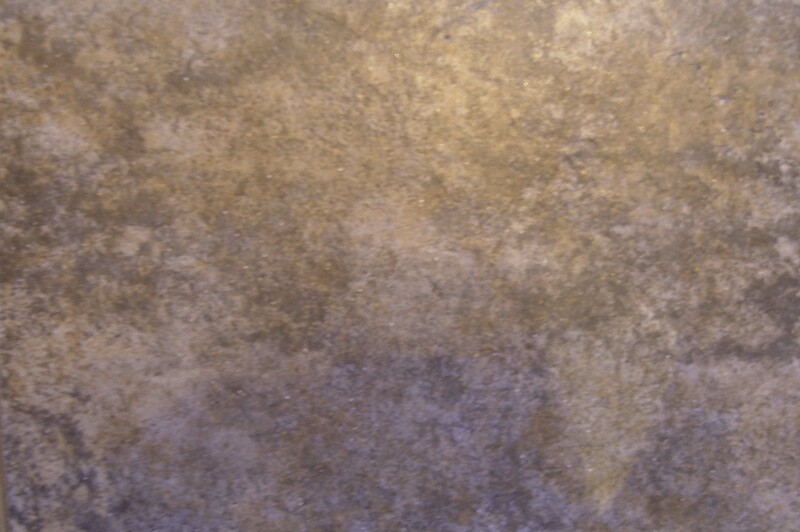 OK, now I think I need to do something to make it look more like sky and less uniform in color/gradient so I selected a colored, mottled, background image that I could use to add some subtle texture to the background. See Figure 4. I opened the texture file, copied it (Ctrl-A = Select All, then Ctrl-C = Copy) and pasted it into the nativity photo I was working on by going back to that image and doing a Ctrl-V to paste it as a new layer. I then positioned that layer underneath the blue gradient layer and lowered the opacity of the gradient layer to about 62% to allow the texture to show through. 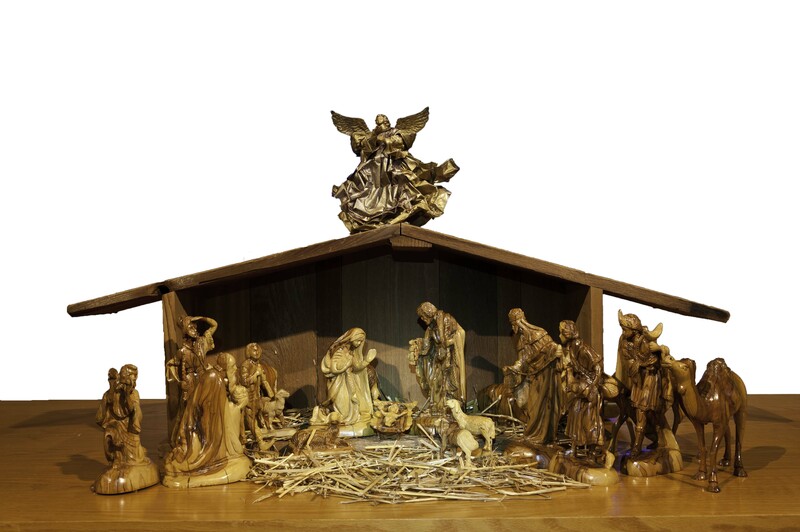 I positioned these two layers UNDER the crèche selection (Figure 2) layer, which as you are looking at an image, places them BEHIND the crèche and knew I was getting close. See Figure 5. Now all I needed to do was darken the “sky” a bit for a more night-like look but I didn’t want to darken the crèche. Remember that selection we saved earlier? 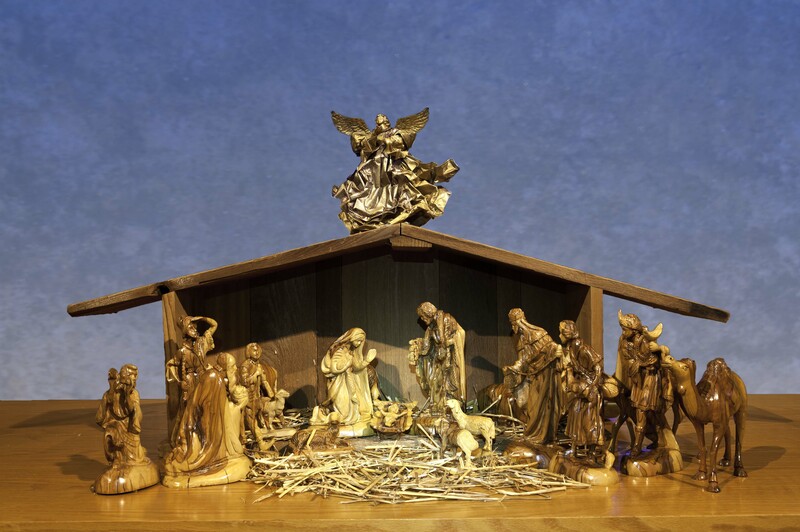 Because I saved it, all I needed to do was Select > Load Selection and click on the name of that selection and it snapped back into place selecting the nativity set. I inverted the selection so the “sky” portion was selected instead of the nativity and then added a new adjustment layer at the very top of my layer stack (Layer > New Adjustment Layer > Levels). Because the sky portion was selected when I added the Levels layer, only that portion would be affected by my Levels adjustment. The final product is shown in Figure 6. So, while this might sound like a lot of work, it isn’t really and with practice it can be done pretty quickly – well, except for the selection process which can be tedious but is the most critical part of the process. FYI – The 6 layers in the final TIFF image are arranged as follows (from top to bottom): Levels layer for the sky, Levels layer for the crèche, selected crèche with background deleted, gradient layer, texture layer, original image background layer.